I know I have said this before but do I ever love my job. 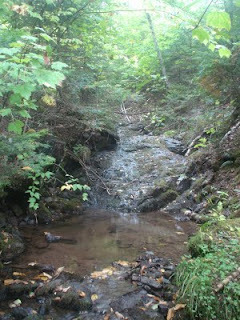 Yesterday we were doing aquatic habitat surveys on a small stream, Mercer Brook, that flows off of Dickie Mountain. This is a relatively large hill that rises up from the northern banks of the Kennebecasis River just west of Norton. For some time I had been wanting to explore this area as the "Mountain" seemed as though it might possess some interesting topography. We headed out in the fog, hoping the rain would hold off for the day. As we drove up the Dickie Mountain Road the visibility was very poor. As the saying goes "The fog was as thick as pea soup." We reached the location where we thought Mercer Brook started and easily found a drainage to confirm our guess. Doing these habitat surveys can be challenging as you have to stick to the stream bottom. Sometimes this can lead you through some pretty tough bogs, thickets, or what not. Mercer Brook started out to be not so pleasant as it was muddy and lined with alders, hawthorne bush, and young birch. Shortly though it started dropping rapidly and the trees and the stream substrate changed dramatically. I first noticed a big yellow birch that I could not reach around, and then bedrock dominated the stream bottom. To match this change the fog had lifted and the sun was warming the small, deep, valley. We measured out 100m reach after 100m reach. We noted the substrate, stream width and depth, riparian vegetation, bank conditions, temperature, dissolved oxygen, and flow patterns. 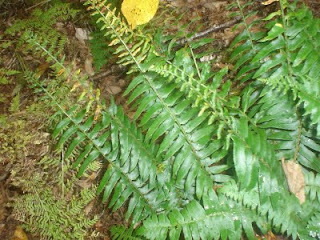 These things were required observations, but we noted the big maples with their changing leaves, the huge aging birch, the ironwood, and the odd spruce and plentiful fir. It is a great thing when you can do your job and enjoy these God given gifts at the same time. On that small stream, in that big forest stand I felt small but so alive. As we head back to the truck I can't wait until the next day when I get to go back and finish the assessment. The short times I sepnd in the field more than make up for the seemingly long hours I spend doing paperwork at my desk.